As per the notification of Government of India, those candidates who fulfilling the minimum academic eligibility (qualifications) prescribed for the post of Assistant Professor or lecturer in the state level institutes or Universities must have qualified in a extensive test, to be specifically conducted for the same; will be eligible for appointment of Assistant Professor or Lecturer. So, the UGC has recommended the introduction of test at entry level Assistant Professor or Lecturer) in consultation with academicians and State education secretaries. So, those candidates, who want to participate into recruitment of state level assistant professor or Lecturer test they must have to qualify NET, SLET/ SET or PhD accordance with UGC 2009 regulations. MP SET Application Form: If you want to participate into MP SET exam then you must have master degree in relevant subjects; and now you will eligible for filling MP SLET Application Form. If you want to apply for the MP SET than you should have to complete various types of MP SET Eligibility. When you fulfill MP SET Eligibility than you will have to fill MP SLET Application form through MPPSC official website i.e. mppsc.nic.in. 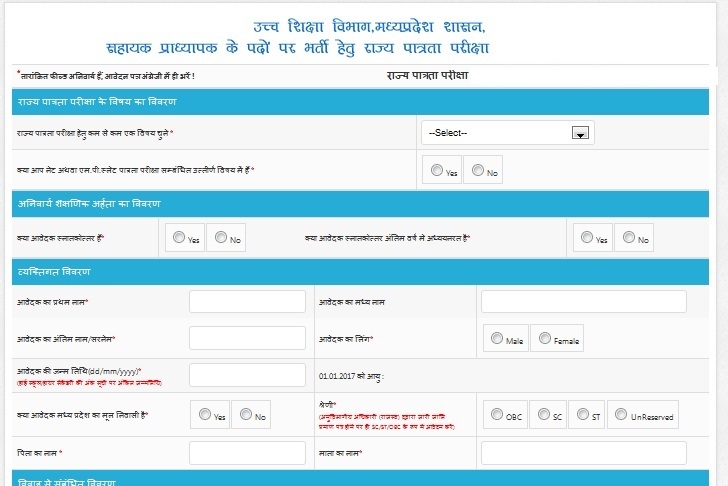 In the MP SET application form you have to fill various information's like name, education qualification, email id, mobile number, address, caste details etc. After that you will have to upload various documents (Proof of DOB, Caste certificate, graduation, masters, PhD mark-sheets and certificates) and passport size photographs of candidates. At the time of documents verification you will have to produce PhD certificate according with 2009 UGC rules and regulations. ✔MP SET Exam Pattern and MP SLET Syllabus : In the MP SET exam there will 3 paper comprise and first paper will be common for all MP SET aspirants and 2 paper will be specific subjects. The MP SET syllabus is near same with the MP PSC Syllabus of specific subjects or NET Syllabus. In the MP State Eligibility Test there will be 3 papers comprised in the exam. Total question 60 and only 50 questions have to attempt. Total question 50 and all are compulsory. There is no –ve marking in the MP SET exam. MP SET Qualifying criteria for OBC, SC, ST, Handicapped candidates. ✔MP SET Subjects : The MP SLET test will conducted only for those candidates who have master degree from recognized universities in Science, arts and commerce subjects. 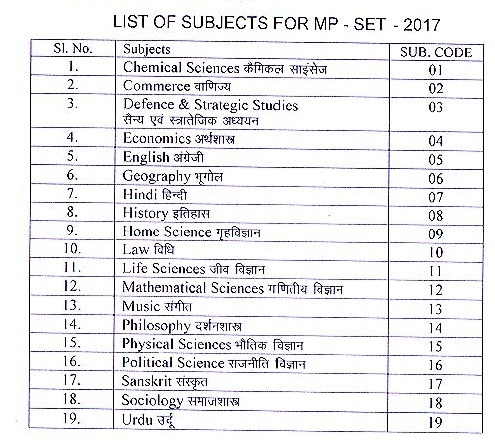 There are more than 20 subjects which will be asked in the MP PSc SET exam. There are 3 papers 1. Teaching aptitude which is common for all aspirants. 2. and 3. paper is specific subject for those candidates who want to appear in that paper. ✔MP SET Eligibility : Only those candidates will eligible for the MP SLET test those who have completed / are studying in the final year or semester of a UGC specified Master's degree with 55% marks (for General category) and 50% marks for category candidates. If Candidates having PG diploma certificate awarded by Indian University/Institute or foreign degree/diploma/certificate awarded by the foreign University/Institute should in their own interest, ascertain the equivalence of their diploma/degree/certificate with Master's degree of recognized Indian universities from Association of Indian Universities (AIU), New Delhi. Candidates are required to appear for MP SLET in the subject of their Post Graduation only. In case the subject of a candidate is not included in the list of MP SLET subjects, the candidates may appear in UGC NET or UGC – CSIR NET which is held twice a year. If you have M.Sc. by Research degree than you will not able to participate into MP SET examination. ✔There will be some special concession or Quota given by MPPSC for SC , ST , OBC, and PH candidates. NET Qualified candidates will be exempted for MP SET exam; and if you want to take MP SET Exam than you are free for participating into the exam. ✔MP SET Admit Card : Most probably the MP SLET Admit Card available at official website one month prior to exam. With the help of MP SLET Application Form Number and date of Birth of Candidate have got MP SET Hall ticket. In the MP SET admit card you will get all information's like: when your MP SEt exam scheduled, exam center name and address, Test time, test duration, photo which is cross check by officer at the time of exam. 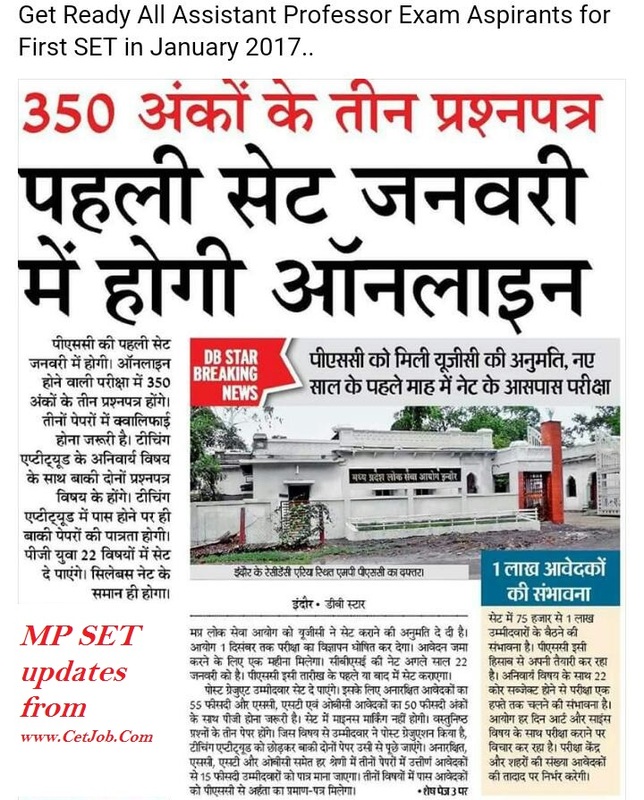 ✔MP SET Results: After the MP SET Test the MP SLET result will announced on March-April ; most probably 60% marks will be the qualifying marks of MP SLET exam. For General candidates you should have to secure more than 40% marks in the SET exam, for Obc candidates you should have to secure 35% marks and for SC/St candidates you should have to secure at least 35% marks in the MP SET exam for qualification. what about computer science?? Isn't there any requirement for a computer science student to give the SLET? or without this can he be a Assistant Professor or do fellowship from university?